Made in the UK, Double Drip proudly introduce their their latest range of maximum VG e-liquids designed for great clouds and amazing flavour. 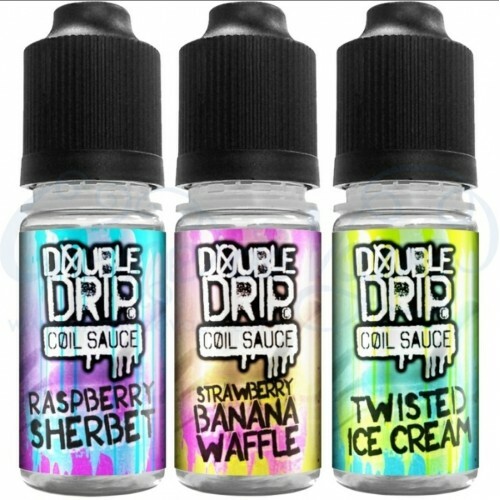 The Double Drip range of "coil sauce" are so good, you'll want to double drip again and again! They are the perfect e-juice to go with any SUB-OHM setup. Strawberry Banana Waffle - a freshly baked waffles topped with succulent strawberries and sweet sliced bananas. Twisted Ice Cream - a frozen strawberry and lemon juice core, enveloped in twists of sweet lime sorbet and smooth pineapple ice cream. Raspberry Sherbet - sweet and sparkling raspberries smothered in mouthwatering sherbet. Crystal Mist - a scrumptious blend of fresh blue raspberry mixed with juicy black cherries, and a dash of menthol, reminiscent of cool refreshing slush. Sun Drip - a fresh pink grapefruit, juicy tangerines and sweet ripe apricots come together for a smooth, vibrant, and unforgettable experience. Lemon Sherbet - a masterful blend of fizzy sherbet and sweet lemon for a tingling citrus experience. Mango Raspberry Ice Cream - a superb taste of fresh mango with a tangy raspberry swirl and vanilla. Orange & Mango Chill - freshly squeezed juicy orange accents the sweet mango during this smooth fruity mix. A touch of menthol finishes this amazing all day summer vape. Caramel Apple Cake Coil Sauce Short Fill E-Liquid by Double Drip Creamy vanilla sponge topped with oven-baked apple slices and heartily drizzled in rich caramel sauce. rainbow sherbet encased in a fruity hard candy shell. Tangy strawberry laces -lavishly dusted with fizzy rainbow sherbet for a truly tongue-tingling taste sensation. Super Berry Sherbet - Super Berry Sherbet takes a mix of seven perfectly-ripe berries and dusts them in a glistening layer of sweet, sugary sherbet for clouds bursting with zest and zing. DRIP TIP - TFV12/TFV8This is a resin drip tip suitable for SMOK TFV12 / TFV8 Cloud Beast Atomizer /..